The Pie & Pastry Bible is celebrating its 20th year with this latest printing with updates. My most comprehensive bible on a single subject, this book's 692 pages with over 250 main recipes, which took me over 5 years to write, covers virtually everything for this area of baking. The pie section includes a wide variety of pie crusts from my favorite tender, flaky, and flavorful cream cheese and butter crust to savory crusts made with goose fat or beef suet. Related chapters cover fruit pies, chiffon pies, meringue pies and tarts, custard pies and tarts, tarts and tartlets, and savory tarts and pies. And what about apple pie à la mode's accompaniment? An ice cream chapter has 10 ice cream recipes as well as ice cream pie recipes. Pastry chapters cover biscuits and scones, fillo, strudel, puff pastry and croissants, Danish pastry, brioche, and cream puff pastry. Filling, topping, sauce, and glaze recipes are here as well, to fill, top, and enhance your pie and pastry creations. You can see a complete listing of all of the book's 250 plus main recipes on this page link. I just reviewed the new 6th printing of the Pie and Pastry Bible and can tell you, with great joy, that every single little tweak has now been integrated, so anyone who gets this or a later printing can ignore the errata link on the blog home page! 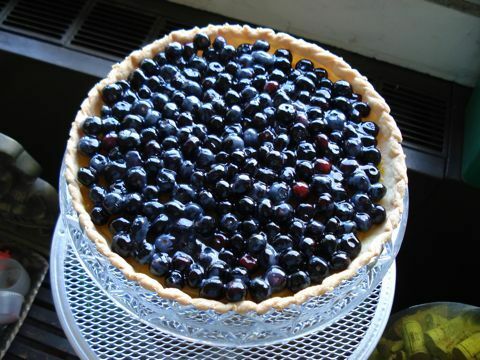 How can I keep a pie crust from shrinking when I prebake it? A pie crust that shrinks a great deal is also one that is tough. This is a result of too much water, too high a protein flour, and or overhandling of the pastry. My cream cheese pie crust in The Pie and Pastry Bible is one that shrinks very little.But it will help any recipe to allow the dough to relax after rolling and lining the pan for at least 1 hour, covered and refrigerated. Lining the crust with parchment and dried beans or peas until it has set also helps to keep itís shape. A coffee filter, the sort used for coffee urns, is just the right size and shape to line the pastry. Bruce Question:I had been wanting to make a tart for some time, so I checked out your The Pie and Pastry Bible of the library again. I had never made a curd before nor the particular crust. I made the lime curd with kiwi. It turned out very very good. I took a couple of pieces to a neighbor. I was wondering about a pineapple tart with oranges. It tastes good in my mind. I was wanting to know how to make a pineapple curd. I would use a fresh pineapple. Should the pineapple juice be reduced first? If so, how much? How much sugar should I use? ps. I own your Cake Bible and I don't use mixes. Thanks. Rose Reply: this is a very interesting idea. i think pineapple and orange would make a good combination. you could do a pineapple tart with orange curd to see how you like the flavors. if you want to experiment with pineapple curd, i would use the delicious golden pineapple for the juice and the same amount of sugar as the orange curd. pineapple juice has a lot of acidity so you probably don't need to reduce it. do let us know how it works! Barry Question: Dear Rose; I can not begin to tell you how much I enjoy baking your recipes. I'm also the proud owner of all three of your "Bibles" I do need your help though. I am consistantly running into the same problem with my pie doughs. For some reason my pie doughs are very crumbly and I'm having a very difficult time rolling the dough out. I measure accurately and use the correct flour for each of your recipes. Am I not kneading the dough enough? I'm afraid to make the dough to tough. Do you have any suggestions? I made your Tiramasu Black Bottom Tart the other day and I was just barely able to roll the dough. The edges of the dough were extremely crumbly. Thank you in advance Barry S.-an avid fan Rose Reply: thank you barry! assuming you are using bleached all-purpose flour or pastry flour, (unbleached will be tougher and need more liquid) you might be using more flour than the recipe calls for if you are not weighing it. try using Wondra flour which is similar to pastry flour and will give you a more tender crust and also require less liquid. also, try replacing the water with heavy cream and add a teaspoon or 2 more if necessary. here's how you can tell: the dough should be crumbly at first but hold together smoothly when kneaded lightly. if in doubt, take a small amount of the dough and knead it to see if it holds together. the best way to knead the dough is to use latex gloves because the dough won't stick to them and you won't need to add more flour. a helpful technique in kneading is what the french call fraiser. using the heel of your hand, smear the dough forward onto the counter one or two times. this will cause any lumps of butter to form long sheets, resulting in flakiness. then use a bench scraper to gather up the dough and with your hands, press it together to form a disc. J Question: Hi - I tried making a "mile high lemon meringue pie" recipe that I found in Fine Cooking magazine. It has brown & white sugar in it. I made it twice and both times the meringue was totally raw when you cut into it. It called for jut browning the meringue under the broiler....I even turned the oven down to 325F. and letting the pie sit in the oven until the meringue turned a liht brown all obver and it still was raw in the middle. I threw away the entire pie after the 2nd attempt...what did I do wrong? Rose Reply: a high, deep meringue can take a long time to cook through. my preference for meringue on a pie is to use italian meringue. the hot syrup cooks the egg white and keeps it from watering out later. i bake the pie at 350°F, then i put it under the broiler for about 20 seconds watching carefully so it doesn't burn. (see page 178 of the pie and pastry bible). 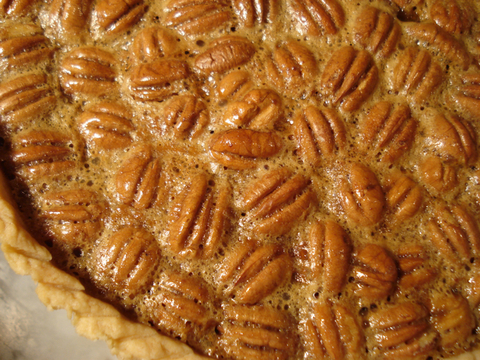 Lura Question: why does my pecan pie always turn out "runny"? Rose Reply: it is the eggs that thicken the pie so if they're not heated enough the filling will become runny. overheating them will cause them to curdle. for this reason, i cook the filling first on the stove top as you would a lemon curd. my recipe will appear on every container of Lyle's golden refiners syrup starting in january. it is in the pie and pastry bible as well. Dora Question:Hello Rose, Before I get to my question, I must let you know that your Cake Bible is phenomenal. Thank you for sharing all your expertise. I've been an avid baker all my life, and this past April I made my first wedding cake for a very special occasion: my sister's wedding. She loves everything lemon, so I decided on a three-tiered cake, each layer consisting of an almond dacquoise base topped with a light layer of lemon buttercream, then alternating layers of genoise classique & lemon curd, and coverered with the buttercream and finished with porcelain white fondant. Her bouquet consisted of white calla lilies, so I made some lilies out of the fondant for the top, and since she loves pearls, the cake was decorated with a royal icing "pearl" variation-on-a-theme: 7 pearls arranged in flower patterns for the bottom layer, 3 pearls arranged in a triangle for the middle, and single pearls for the top. It was a lot of work, but everyone loved it. Now, onto my challenge. I've made creme fraiche many a time before, but lately I've been encountering lots of difficulty with it thickening properly. In the past, after having left the well-covered cream/buttermilk mixture on top of the fridge out to thicken for about 24 hours, it's thickened, and I've put it in the fridge to let it continue to thicken. Afterwards, I've sweetened it, and had no problems. But I'm getting really frustrated with all of my recent attempts. I know that heavy cream can vary slightly from batch to batch, but even though I've tried a couple of brands of whipping cream, I'm still not having much luck. And when I try sweetening it after it's been refrigerated a while, it liquifies way more than it ever has in the past. Any assistance would be greatly appreciated. Thank you so much for your time and for your generous spirit. Warm regards, Rose Reply: crème fraîche is one of the most useful ingredients to temper the sweetness of desserts, to add to scrambled eggs for a rich creaminess and tangy flavor, and to sauces. there is an excellent product available from vermont butter and cheese company. as you know, making your own is quite easy if you can obtain cream that is NOT ultrapasteurized. sadly this is becoming more and more difficult. it has been my experience that with ultra-pastuerized cream, it will eventually thicken if left in a warm spot of 80 to 90 degerees but it may take several days. my best advice is to befriend your local bakery. they usually have access to commercial 40% butterfat cream that is not ultra-pasteurized. (that's what i've done!) offer to buy it and i'm sure they will be generous in ordering extra for you.